We are not just another forklift service department. Mobile service, no trip charge, and fully stocked service vehicles! TMH provides 24-hour service, emergency repairs and planned maintenance on all types and brands of forklifts and material handling equipment. You choose your service location - at your facility or at one of the five TMH Branches. We are not just another forklift service department. Qualified service technicians maintain and repair all forms of material handling equipment such as forklifts, balers, crushers, sweepers, scrubbers, aerial lifts, conveyors, and more! When we repair your equipment, we use high quality Toyota Forklift Parts to ensure that you're getting the best of the best. Mobile Service - We'll come to you! 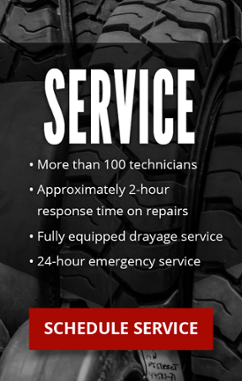 Our service department is standing by ready to help. Contact the nearest TMH branch to schedule a service call or fill out our service & parts request form. Toyota Material Handling parts have competitive prices for all-makes of forklifts, sweepers, scrubbers, personnel carriers, aerial work platforms, tow tractors, and other material handling equipment. TMH stocks over 1 million dollars in parts inventory, including major and minor repair parts for all our OEM's - we are proud to have a 95% fill rate. For special orders, we offer 24-hour turnaround with freight or free freight on standard 5 to 6 day orders. Questions about parts or service? We're here to help!